In 2016, GetHiking! 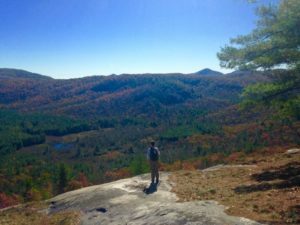 The Southeast’s Classic Hikes - GetGoing NC! In 2015, we launched our GetHiking! Classic Hikes program with GetHiking! North Carolina’s Classic Hikes. 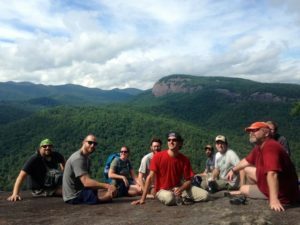 Over the course of the year we hiked a dozen of North Carolina’s most notable areas: Shining Rock, Mount Mitchell and the Black Mountains, Panthertown Valley, the Mountains-to-Sea Trail and the Appalachian Trail, to name a few. 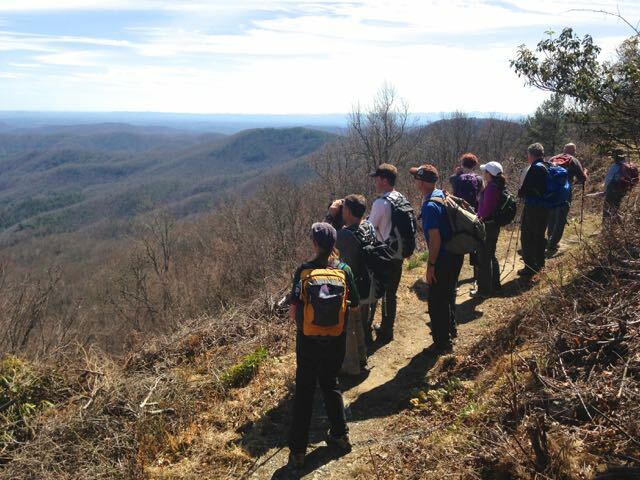 Now, if there were only a dozen Classic Hikes in North Carolina, we could declare mission accomplished and be done. In fact, there are so many more than a dozen Classics in the state (I’ve written a book that documents 100, “100 Classic Hikes in North Carolina,” Mountaineers Books). And there are so many more Classics throughout the Southeast. Thus, our mission continues in 2016, with the expanded GetHiking! The Southeast’s Classic Hikes series. First, we’re not abandoning North Carolina. 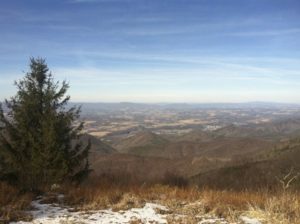 In fact, we’re only adding two out-of-state hikes in 2016, both in Virginia (a stretch of the Appalachian Trail near Lynchburg and the Grayson Highlands/Mount Rogers area). And while we are repeating two hikes from 2015 (Panthertown Valley, by popular demand, and Doughton Park, because it’s a good late winter mountain hike), we’ve got a North Carolina lineup that will expose you to even more great hiking than you thought possible. We’ll get to a full calendar of hikes, with descriptions, in a sec. But first … . Why join this fee-based hiking program? 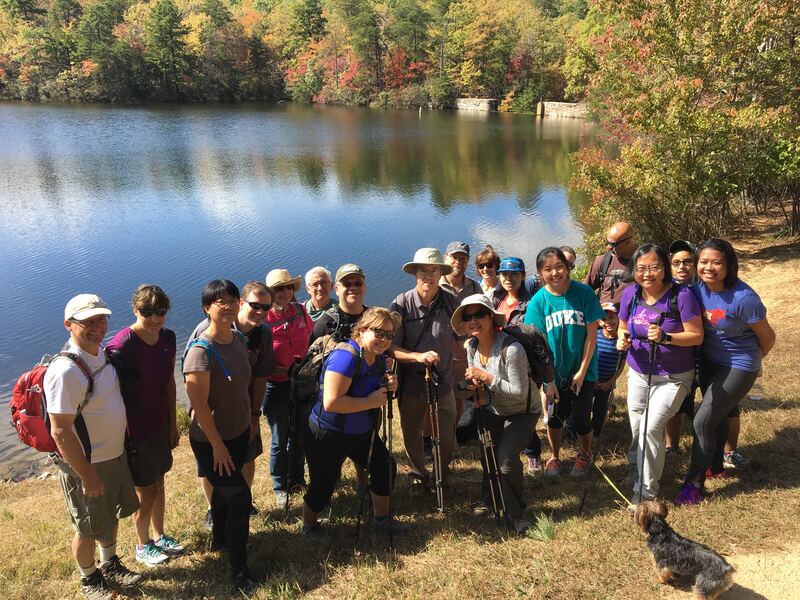 We had about 90 hikers participate in the 2015 program, all with their own personal motivation. Basically, though, they boiled down to two key motivators: the challenge, and the chance to explore more of the state’s wild areas. Right about now you’re likely thinking what most people are thinking on the cusp of a new year: how can I be more active in the year ahead? Hiking is a great option. First, just about anyone can do it, and unlike many other “active” options, it’s something you can be active at late into life. (Of our 90 or so 2015 hikers, at least half are over 50.) Hiking requires some basic equipment: hiking boots/shoes, good socks, a day pack, for starters. But once you’ve got the basics, it’s cheap fun: transportation and food are your key expenses. If you’re new to hiking, you might be intimidated by the “Classic” designation, equating “Classic” with epic and visions of a death march rather than an enjoyable day in the woods. First, our hikes are actually two hikes, a longer hike and a shorter hike. For instance, our first hike, on the Neusiok Trail in the coastal Croatan National Forest, gives you the option of hiking the entire 20.4-mile trail, or a 6-mile stretch. Start with the shorter options, maybe you’ll want to go longer after three or four hikes. Plus, the monthly hikes are good incentive to do shorter, local hikes in the interim. If you’re looking for an activity you can embrace for the longterm and one that doesn’t seem like work (as is often the case with a traditional “workout,” hiking is a good option. Likewise, if you seek a sense of accomplishment and reward, you’ll find it in a hike (just ask the folks who did our 13.4-mile hike on the Appalachian Trail north of Carvers Gap in September). And if you’re worried about being left in the woods, don’t be. 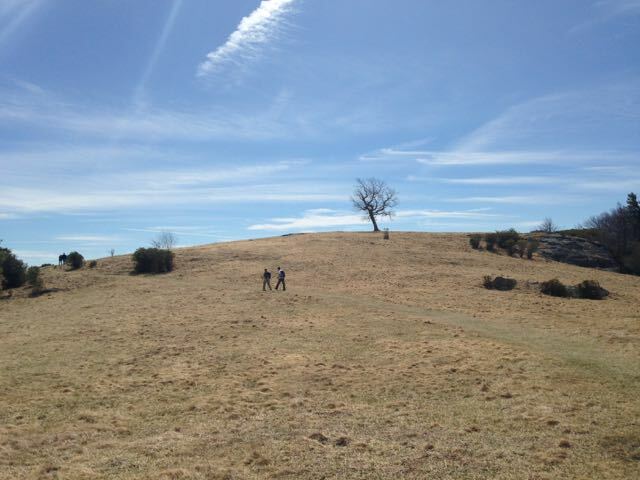 Our hikes are led from the rear, guaranteeing that no one, not the slowest hiker, is dropped. This approach benefits our more experienced hikers as well; with direction supplied before the hike, they become more confident in their ability to navigate in the backcountry. Even if you’re an avid hiker, how many of the state’s — and region’s — trails have you hiked? Or are even familiar with? Drop down and take a look at our lineup for 2016: if you’ve hiked half of these trails, you’re doing pretty good. Odds are there are one or two you haven’t heard of. 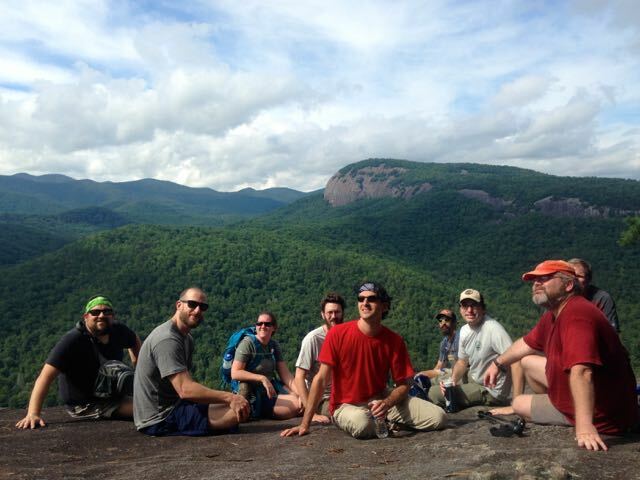 We aim to expose you to the wealth of hiking opportunities in the Southeast. Take the October hike. Perhaps you’ve heard of, even hiked in the Shining Rock area. But Sam Knob? Its neighbor to the west offers a more varied hike: the views, meadows and black balsam forests Shining Rock is known for, plus rock outcrops and waterfalls. As for the July Standing Indian hike, we’re guessing that one’s got you scratching your head. After the weekend of July 16-17, 2016, you’ll be boasting it’s one of the best circuit hikes around. Again, check the schedule below for descriptions of 2016’s hikes. Weekend trips. Over the past year, several of you commented that you loved the mountain trips, but you wished there was more hiking to justify the long drive. This year we’ve added six camping weekends in the mountains. Drive up Friday afternoon/evening, camp, hike Saturday, camp Saturday night, hike Sunday. Camping will be in group campgrounds near the trails we will hike; in some cases we can hike directly from camp. Our one group camp experience in 2015, at Mills River, was a big hit, highlighted by a potluck dinner Saturday evening. Aren’t a camper — but you’re interested? This year, we’ve added a Discover Camping option to our weekend trips. We provide the tent and sleeping mattress, give you a list of household items you can use to supplement your other camp needs, and are there to help take the mystery out of camping. Lodge/hostel weekend on the AT out of Hot Springs. Over the three-day Veteran’s Day weekend (November 11-13) we’ve reserved the Laughing Heart Lodge in Hot Springs, North Carolina. Hike the Appalachian Trail during the day, return to the lodge/hostel for a civil evening of rest in a warm environment (see schedule for details). Three hikes, as mentioned above. After that, each single-day hike is $25, weekend trips are $35. Monthly emagazine with detailed information on that month’s hike, including an overview touching on the trail’s highlights; map of the hike with points of interest; elevation profile; photos; info box with key information, including trail access, length, elevation gain and more. Also in each emag: information on camping and lodging near each hike, as well as hiking tips and resources pertinent to this particular hike. Swag bag for each hike. For each hike you’ll get a goody bag filled with hiking-appropriate swag. Joining gift. TBD. Last year, members received either hiking socks, a camp towel or a GetHiking! T-shirt, courtesy Great Outdoor Provision Co.
Loaner gear. Curious about trekking poles but never tried them? Here’s your chance. We’ll also have loaner headlamps (if you’re worried about finishing after sunset). Ten percent discount on hiking gear at Great Outdoor Provision Co. If you think you’ll make all the hikes, save $60 by joining the Classics Club for $300. That covers all the hikes, plus the Discover Camping program, and get a $35 gift card from Great Outdoor Provision Co.
Sign up today and we will send you pertinent information about the program, as well as details on our first hike, on January 24 on the Neusiok Trail. Pay via PayPal, below, or send a check to GetGoingNC, 4909 Waters Edge Dr., Suite 206, Raleigh, NC 27606. Here’s the full schedule of our 2016 GetHiking! The Southwest’s Classic Hikes. We start the year in a coastal forest, on a lowland trail that spends much of its eastern length in pine savannah and on boardwalk elevated above a shrubby bog, its western end in forest that has odd flashes of the Appalachians. The Neusiok is a trail best hiked in winter, when the flying pests common to the coast are less pesky. As you might guess, there’s little elevation on this hike, making it a good hike to start the year. The Uwharries, in the heart of the rolling Piedmont, may have long since eroded from their 20,000-foot peak, but they still present a nice challenge. A challenge not without its reward: especially Sections 3 and 4, where the trail reaches its high point (King Mountain, at 1,013 feet) and offers its best view, a 360 from the top of Long Mountain. Both hikes include this stretch; the longer hike lets you build endurance as you probe deeper into this largely hardwood forest. One of the few repeats from the 2015 Classic Hikes season, and for good reason. For starters, it’s an early-season opportunity to get into the mountains. Located on the Blue Ridge escarpment north of Wilkesboro, both hikes begin with a steady 4.5-mile climb before topping out in the rolling mountain meadows of Doughton Park. The short hike finishes at Bluff Mountain, the long brings it back around down a descending ridgeline to the Longbottom Trailhead. Great views from the top — and early spring wildflowers to boot. 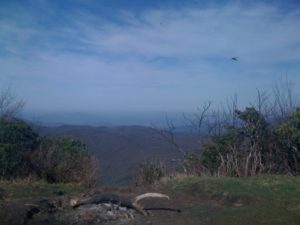 Think of day hiking the Appalachian Trail and you immediately think of driving half the day to western North Carolina. In fact, the AT is closest to the Triad and Triangle, at least, in Virginia. 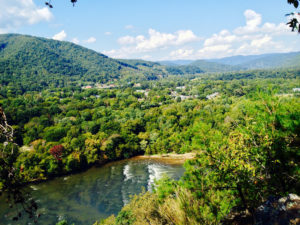 Where the AT crosses the James River west of Lynchburg is an especially scenic stretch of this iconic trail. From the Blue Ridge Parkway, the trail climbs to Punchbowl, then stays along a ridge for about 7 miles, offering an ongoing supply of views, both east to the Piedmont and west to the Shenandoah Valley and George Washington National Forest. The first of six weekend hikes with group camping. Arrive Friday night, set up camp at the Briar Bottom Group Campground at the base of Mount Mitchell, then hike from Buck Creek Gap back to the campground on Saturday. A potluck Saturday night, followed by more hiking, at Craggy Gardens on the Blue Ridge Parkway, Sunday. A good sampling of a stretch of the Mountains-to-Sea Trail that doesn’t get hiked much because of its remote location. Our lone group camping experience in 2015 at Mills River was a hit. We return to the area, this time to the White Pines Group Campground in the adjoining Davidson River area of the Pisgah National Forest for a weekend of hiking. Saturday, we’ll hike a stretch of the Art Loeb Trail heading down from the Blue Ridge Parkway, then return to camp to kick back and enjoy a pot-luck dinner. 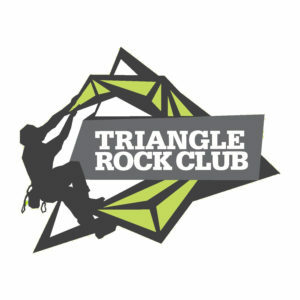 Sunday, we’ll do the popular 7-mile John Rock Loop, enjoying lunch and views of Looking Glass Rock from the trail’s namesake attraction. On our third Saturday/Sunday hike we visit the Standing Indian area west of Franklin. The Standing Indian group campground is ideally situated for our purposes. 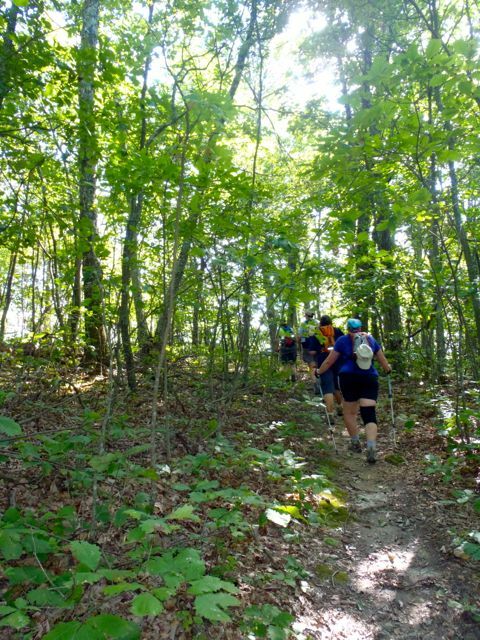 Saturday morning, head out your tent door and onto the Kimsey Creek Trail for a climb up to the Appalachian Trail, returning via Lower Ridge Trail. Sunday, we do another AT loop, up Timber Ridge to the AT and back via Bear Pin Gap. August too hot for hiking? What if your hike ends with a tube trip down a mile-long stretch of mountain creek. That’s an option both days, on hikes that start and end from our group campsite at Deep Creek, just outside Bryson City. Our second trip of the year to Virginia is our first to the Grayson Highlands / Mount Rogers area of southwest Virginia. 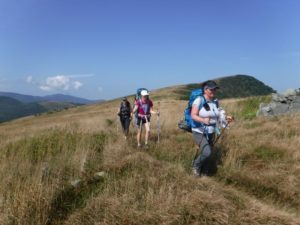 Grayson Highlands/Mount Rogers is one of the most popular trail networks in the Southeast, in no small part because the rocky and open terrain has more of a western U.S. feel. Also, the wild ponies. 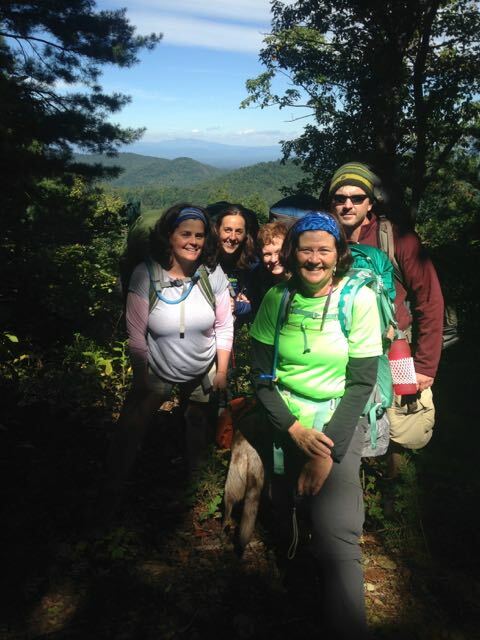 Our last weekend group camping trip of the season sees us return to Panthertown Valley for waterfalls, views and great fall color, then head up to the Shining Rock Area for a diverse 8-mile loop at Sam Knob. Both areas are known for rock outcrops, open spaces and waterfalls. Three days of hiking (it’s over Veteran’s Day weekend) and two nights at the Laughing Heart Lodge in Hot Springs. 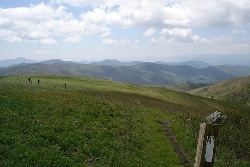 The hiking includes various stretches on the Appalachian Trail, from Max Patch to Hot Springs. The lodging is at the laid-back Laughing Heart Lodge, where we’ve blocked out space for the weekend. Stay in the lodge, stay in the cabin, stay in the economical hostel. Off trail, we’ll explore one of the AT’s classic trail towns. 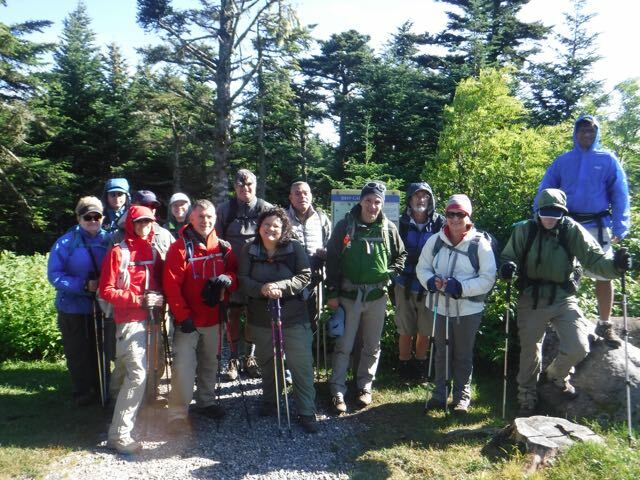 We wrap up the year with a celebratory climb up the highest peak in the East, 6,684-foot Mount Mitchell.